As you strive to find your unique calling to make a difference in this world, we invite you to utilize this catalog as a resource to aid in planning your academic journey. Within this catalog application, there are several icons you will see at the top of the individual pages. Below is an explanation of how these tools work. Create a personal portfolio account with the My Portfolio link at the bottom of the menu on the right. Then add programs or courses that are of interest to you by clicking the Add to Portfolio icon. Share the programs or courses that pique your interest on Facebook or Twitter by clicking the social media icon at the top of the page. On pages where this icon is found, you may generate a pop-up page that is formatted to print cleanly. As you are browsing the catalog, if you need more information on how to use the catalog application, click the help icon in the upper right corner. The mobile site for the catalog can be found here. 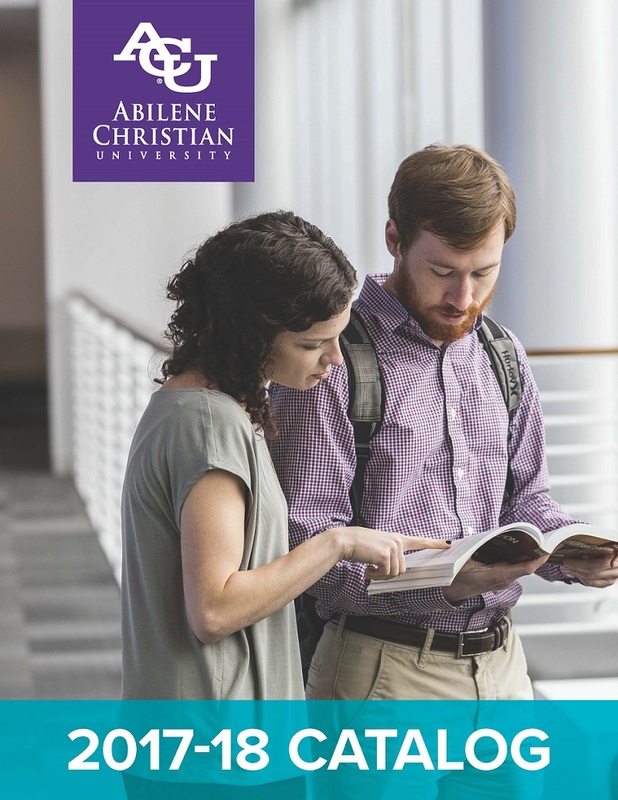 This catalog contains information about undergraduate and graduate programs at Abilene Christian University and is intended to be a description of the policies, academic programs, degree requirements, and course offerings in effect for the 2017-2018 academic year. The responsible parties within the university review and make necessary updates to the contents of the catalog at least annually. The university has endeavored to make it as accurate as possible at the press deadline. It should not be construed as an irrevocable contract between the student and the university. Abilene Christian University reserves the right to change any of the policies, procedures or fees described in this catalog and to apply these changes to any or all of its students as it finds necessary. The university may also choose to add or delete course offerings, degree programs, or other programs at any time. The catalog is designed to make planning and scheduling a degree program as simple as possible. Additional help is available from several sources, such as undergraduate academic advisors in Wildcat Central, the Office of Graduate Programs, college deans, program directors, and faculty advisors. Each student at Abilene Christian University, however, is ultimately responsible for understanding and fulfilling all degree requirements.